The technology industry has been feverishly buzzing with the release of new big-name products and the latest and greatest in gadgets and gizmos at this week’s CES event. Not to be overshadowed by Samsung and LG’s Ultra HD TVs or flexible display phones, an array of trendy, innovative apps made their debut at the techy event. Dr. Dre isn’t the only rapper on the tech scene. LL Cool J, along with his famous pout, joined CNET on stage at CES this week to discuss a new music software app that allows users to record and compose music on any mobile device. The Liquid MyConnect Studio App from Boomdizzle is slated to be the most futuristic recording studio. Using the app, users can collaborate and compose beats remotely using an Internet connection on their mobile device. The Liquid MyConnect Studio App is Boomdizzle’s latest addition to its music-related portfolio including a wide variety of products that eliminate constrictive barriers for musicians. Stress – it’s something that almost every human being experiences, unless of course you’re the Dalai Lama (and we’re pretty sure he has some stressful moments, secretly!) Although new technological advances have made some aspects of our lives easier, and not to mention lazy, we still remain on edge at times. Face it, we’re humans, not robots. We have real emotions, one of them being stress, and tons of it. To combat the “world’s stress epidemic,” HeartMath and Arianna Huffington of The Huffington Post have teamed up to face this “stressful” battle (pun intended). GPS for the Soul, which launched at CES this week, helps users indicate stress triggers. To keep your inner chi on track, using your phone’s camera lens as a sensor, the app measures your heart rate and heart rate variability (HRV). After honing in on your heart rate and HRV, the app provides you with real-time “guides” to help you regain your chi. 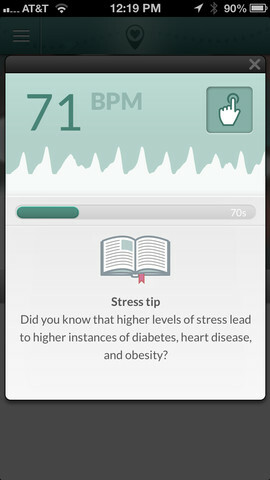 The guides are generated by the app to include things like breathing exercises, music or poetry. Users can also create their own guide with inspirational pictures or quotes. Feeling all alone and stressed out? The apps activity feed gives you real-time updates about how your friends and family are feeling. Users can even “favorite” other “guides” or share their own suggestions to reliving stress. This may seem like an app for the treehugger, free love type, but let’s face it – we could all use a reminder about the important things in life. On a much lighter and wackier note, NIVPAT recently debuted its impressive t-shirt technology at CES this week. A person’s style can tell a lot about their personality and interests. You wouldn’t necessarily think a person wearing an Obama t-shirt was a Republican, right? Although, we could peg a guy wearing a Darth-Vader t-shirt as a die-hard Star Wars fan. See what I’m getting at? Taking personal style to the next level, NIVPAT transforms clothing into “interactive communication platforms.” NIVPAT, an artificial intelligence solution, tags a piece of clothing with a unique ID, or label. This ID is then linked to a person’s profile, which can be connected to their LinkedIN or Facebook account. After locating the NIVPAT tag on your garment, register and activate your profile using the NIVPAT app. Connect to other users by simply pointing your iPhone toward them. The NIVPAT app will then share information about the user, for example, the user’s name, e-mail address and Facebook account. The NIVPAT app can also be used for promotional marketing messages, such as product information. Each garment is equipped with a unique tag. The app can recognize NIVPAT garments at a distance or under poor lighting. Although this technology only works with NIVPAT garments, multiple garments can be linked to the same social profile. Now that’s a new way of social interaction! CES brought about a ton of new innovative apps, gadgets and gizmos. Whether you’re potty training your child with an iPad or monitoring your weight with a fork, today’s technology keeps getting better! Be sure to tune into next week’s Apps on Tap!